Avoid feeding your Husky two hours before travel. This should give time for the food to digest and not swirl around in the tummy. 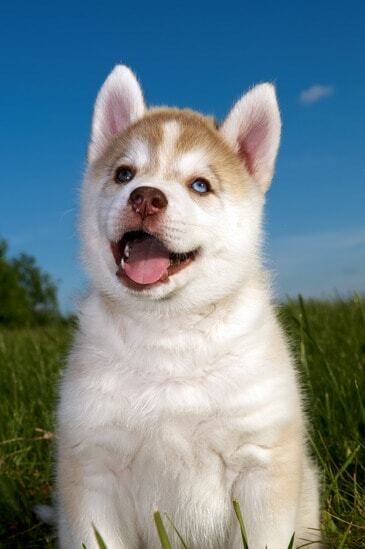 If your dog does get sick (and husky puppies are especially prone to car sickness) there will be less mess to clean up if they vomit (throw up). When your Husky has an accident (toilet or vomit) it pays to be prepared to clean it up quickly, efficiently, and without fuss. You will need paper towel, bath towels or blankets, plastic bags, wet wipes and and some basic cleaning gear to get the job done. Secure that Husky! We all see dogs in cars jumping around, heads out the window, barking at other motorists. That’s irresponsible and dangerous. In an accident the dog becomes a pinball that bounces around – causing all sorts of terrible injury. So secure your dog down. This also helps calm the dog because there is less opportunity to get hyped up. Safety belts have the advantage of securing dogs down very well – so that there is little or no movement possible in the event of an accident. If you go this way then make sure the belt is made out of very strong material because your Husky is likely to get bored during travel and start chewing. Large enough so that your Husky (both now, and as it grows larger) can get up and turn around. Quality, sturdy, construction that will last the bumps and movements that come from travel, carrying it in and out of the car regularly. Construction that is chew-proof when your dog is inside. A stable base. You might need to further tie the crate down to stop movement on the floor so look for anchors and methods to tie these straps in to. Strong and doggy-proof latches. Siberian Huskies are known for being escape artists – just check out this video. Ease of cleaning, especially on the road where you might not have a hose available. Some vans and SUVs have a trunk section that can be caged off from the passenger section. This is better than having the dog on the front seat but you might still want to consider securing him or her further, depending on how large the area is. Whatever you choose to do you will probably need blankets or mats under the dog – to trap the doggie hair and also any accidents. If your Husky is out the back of your car or van there might not be a lot of ventilation back there. So open up windows or turn the fans on and blow air down that way. Sitting in front of a window on a sunny day can get quite warm so you might need the A/C on as well. You would never leave a child unattended in a car and a dog is no exception. Even if you crack the windows open this is rarely enough to stop the heat, let alone provide adequate ventilation. Hopefully you have someone who can stay by the car and supervise. Open the trunk or tailgate to let more air through when the car is stationary. How are you going to get your Husky in and out of the car, safely, and on leash? Unless you have two strong individuals it might not be possible to lift a dog crate in and out each stop. Work out the process of getting your dog up in to the car and in to a safe position. For exit you need to work out how you will get the leash on to your dog safely, before it has a change to jump out of the car and run. Just like children, a lot of noise, uncomfortable movements, and unnecessary commotion can distress dogs. If an incident happens such as an unexpected toilet stop or travel sickness there is no need to make a big fuss about it. Clean up and carry onwards. Also like children, Huskies can get bored in the car. It is their nature. Pull over every hour and give your dog a bit of water and a walk around. You might have to bring along a bowl and water if there is none along the way. Of course if your Husky is sleeping then push through and enjoy the journey! If you are heading quite a distance away from home, have you thought about what will happen to your Husky if your car breaks down? Check your auto association or mobile mechanic to see if they cover pet retrieval. Also consider what if your dog really doesn’t like travelling? You might want to think about the possibility of taking it slow and easy, even if that means breaking the journey up over two days. Not all dogs like travel, and car travel especially can be disruptive and dangerous. 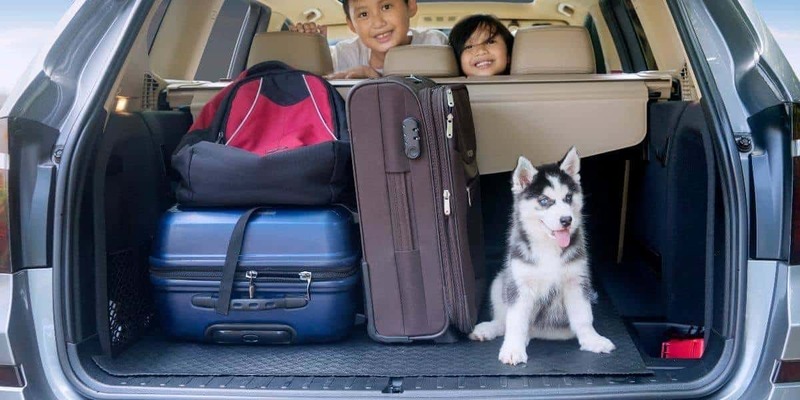 We hope these pointers help you and your Siberian Husky travel safely and in good health.